Fat Quarter Love is a small pattern booklet that's the size of a folded fat quarter and filled with 8 patterns (including two new ones) that use this popular precut size. 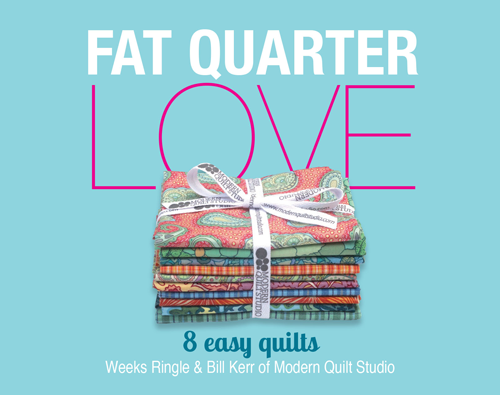 Fat Quarter Love is the perfect solution to the question "I have so many fat quarters but what should I make with them?" The 8 quilts are shown in the alternate photo. They are, from upper left to lower right: Acadia (napping size), Follow the Leader (napping size), Woodlands (napping size), So Inclined (napping size), Flower Show (twin size), Band Together (Queen/Full size), One Love (napping size), Simple Gifts (Baby quilt).